Camping Soleil de la Mediterranee is a large, family orientated campsite that occupies a wonderful position on the outskirts of Saint-Cyprien. This pleasantly landscaped and well maintained campsite offers the perfect balance between on site activities and location. Saint-Cyprien marina is one of the most popular and also largest pleasure ports in France and as such is a fantastic place to spend a few hours. Walk around the marina and take a look at some of the fantastic boats or sit down in one of the many cafes, restaurants and bars and enjoy a drink or some local cuisine. One of the great things about the area is the quantity of cycle tracks and paths. There are in excess of 22km of footpaths and cycle tracks to explore around Saint-Cyprien which is fantastic for those wanting to get out and explore the beauty of the surrounding areas. The nearest beach to Camping Soleil de la Mediterranee is just 800m away. Here you’ll find plenty of space to relax in the sun by the warm waters of the Mediterranean sea, play in the sand or indeed swim. The main attraction at Camping Soleil de la Mediterranee apart from its brilliant location is the campsites fantastic swimming pool complex. Covering around 3500m2 the aquatic area is larger than many others in the area. Offering a covered heated pool, outdoor lagoon styled pool, children’s pool with play area, several fantastic water slides and a large amount of sunbathing areas for parents, you and your family are sure to have a fantastic time. 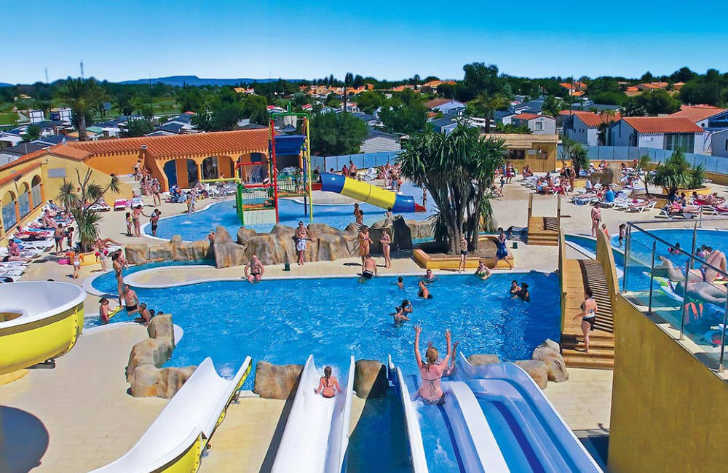 Camping Soleil de la Mediterranee campsite offers a comprehensive selection of activities and facilities on site and also nearby to ensure you have a fantastic family holiday. On site activities at Camping Soleil de la Mediterranee campsite include table tennis, multisports area, archery, electric scooter hire, football, basketball, volleyball, boules, cycle trail, steam room, playground and cycle hire. Facilities available at Camping Soleil de la Mediterranee campsite include WIFI, restaurant, takeaway, snack bar, bar, groceries, animation team, washers and dryers. Accommodation at Camping Soleil de la Mediterranee campsite includes a range of 2 and 3 bedroom mobile homes that are available from Canvas Holidays .